﻿﻿﻿Lake Arrowhead State Park offers prairie dog towns, disc golf, horse trails and great fishing. ﻿﻿Just south of Wichita Falls, Lake Arrowhead beckons residents who want to get outdoors and enjoy a relaxing day in nature. Many local anglers know that crappie, catfish and white bass are plentiful and enjoy Lake Arrowhead State Park’s lighted pier year-round. The park participates in the Texas Parks and Wildlife Department’s program to lend fishing poles and tackle to park visitors. Youngsters can learn how to fish through the angler education programs offered throughout the year and earn awards at Lake Arrowhead State Park’s annual fishing tournament on the first Saturday of June. What many people don’t know is that Lake Arrowhead is the only state park in Texas with a disc golf course. The 18-hole course, strategically situated in the mesquite plains of the park, offers challenges to both novice and advanced disc golfers. Park Superintendent Keith Gauthier started playing disc golf in college and has made it his mission to improve the course. Park staff cleared some invasive mesquite growth to create a more open and friendly fairway. The park hosted the first Lake Arrowhead State Park Disc Golf Championship last September. Gauthier hopes more disc golfers from around the state will participate in the 2013 event on Sept. 14. Horseback lovers can saddle up for a mounted exploration of the Texas Rolling Plains on 5.5 miles of equestrian trails. The park offers a special equestrian campground that features four campsites, each with a picnic table and fire ring for the riders, and a corral with four covered stalls and hitching posts for their horses. Recent campers from South Dakota enjoyed a ride on the Onion Creek Trail, experiencing their first sightings of prickly pear and armadillos. For a true Texas nature experience, visit Lake Arrowhead’s prairie dog town. Towns of these lively “barking dogs” of the prairies and plains covered much of West Texas and the Panhandle before the 1900s. 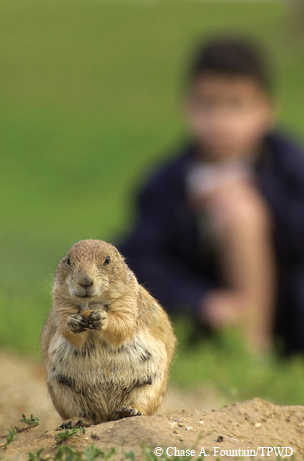 Find a viewing spot and watch as the prairie dogs pop in and out of their mounds. Scientists have found that prairie dogs use at least 12 distinctive calls to communicate with each other. You’ll be able to locate the sentry that calls out danger alerts to the prairie dog colony if you get too close. If you’re lucky, you may see a prairie dog do a “jump-yip,” launching straight into the air and making a wee-oh sound. This is one of the few public places in Texas where you can see an active prairie dog town, so don’t miss the chance to have your own memorable “jump-yip” wildlife watching experience. Lake Arrowhead State Park is located southeast of Wichita Falls. From Wichita Falls, go eight miles south on U.S. 281, then eight miles east on FM 1954. From the Dallas area, take U.S. 287 north to the Jolly exit (FM 2393), travel 10 miles south until you reach FM 1954, then travel southeast for three miles.